Established in 1884, Canandaigua’s Woodlawn Cemetery sits on over seventy acres of picturesque land on North Pearl Street. Listed in the National Register of Historic Places in 2014, the cemetery features the stunning Mary Clark Thompson chapel. Thanks to a preservation-minded board of directors led by President Patrick Cooney, along with superintendent Doug Stone, the chapel, long in need of substantial maintenance and identified community uses, is currently undergoing extensive rehabilitation with funding from New York State and a collection of private donors. The project architect is Bero Architecture, with Frank J. Marianacci, Inc. serving as the general contractor. The Landmark Society is assisting with general project consultation. Construction on the chapel began in 1909 through the generosity of philanthropist Mary Clark Thompson. The building was designed by Boston architect Francis R. Allen, known for his work in the Gothic Revival style of architecture. Dedicated in 1910, the chapel is constructed of limestone and Medina sandstone, with imported stained glass and a pipe organ built by the Massachusetts firm, Hook and Hastings. During construction the chapel was actually built around the already existing receiving vault, which had been built in 1892. Changes in funerary customs led to the chapel becoming underutilized and falling into disrepair. It was closed form use in 1960. Over the decades further deterioration threatened the chapel’s survival. 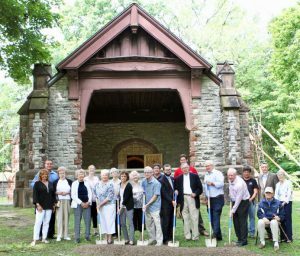 Realizing an opportunity to embrace the cemetery’s history, and seeing an opportunity to expand the cemetery’s connectivity with the community, rehabilitation of the chapel was long a goal for superintendent Doug Stone. greater community. Anticipated uses include weddings, lectures, recitals, meetings, and worship and funeral services. The targeted completion is late spring of 2019. Cemetery chapels face challenges associated with neglect and lack of use. The Landmark Society encourages and applauds creative uses for these forgotten resources. Another chapel success story, the Hillside Cemetery Chapel in Clarendon, appeared on The Landmark Society’s Five to Revive list in 2014; it is currently undergoing rehabilitation and will be used for a variety of uses.